Designed with a traditional style and strong build, this vanity is a perfect choice for any bathroom. Its beautiful white quartz counter and white solid wood base bring a great new look into your bathroom. Its drawers and roomy double-door cabinet are great to keep bathroom items in. Make your bathroom look like new with this good-looking, useful set from Simpli Home. For a bit of classic style in your bathroom, choose this beautiful vanity. Made with a special white particle board base and vanity top in white, this piece will make your bathroom look even nicer. The simple look of the single-door cabinet and drawers is useful and classic. Bring a classic look and feel to your bathroom with this beautiful set from GLACIER BAY. Enjoy the popular modern look in your bathroom with this beautiful Glacier Bay Romali vanity. With a white ceramic counter and white particle board base, this product is good-looking and useful. The double-door cabinet and drawer are great for putting away bathroom items. Put a nice touch on your bathroom's look with this vanity set from Glacier Bay. For a bit of traditional style in your bathroom, choose this beautiful vanity. With a white engineered stone counter and white particle board base, this product is good-looking and useful. Made with a roomy double-door cabinet and drawer, this vanity has lots of room to keep items like toothpaste, towels, and hair brushes. Put a classic feel in your bathroom with this good-looking set from Home Decorators Collection. Winston 43-inch W 3-Drawer 2-Door Freestanding Vanity in White With Quartz Top in White Designed with a traditional style and strong build, this vanity is a perfect choice for any bathroom. Its beautiful white quartz counter and white solid wood base bring a great new look into your bathroom. Its drawers and roomy double-door cabinet are great to keep bathroom items in. Make your bathroom look like new with this good-looking, useful set from Simpli Home. 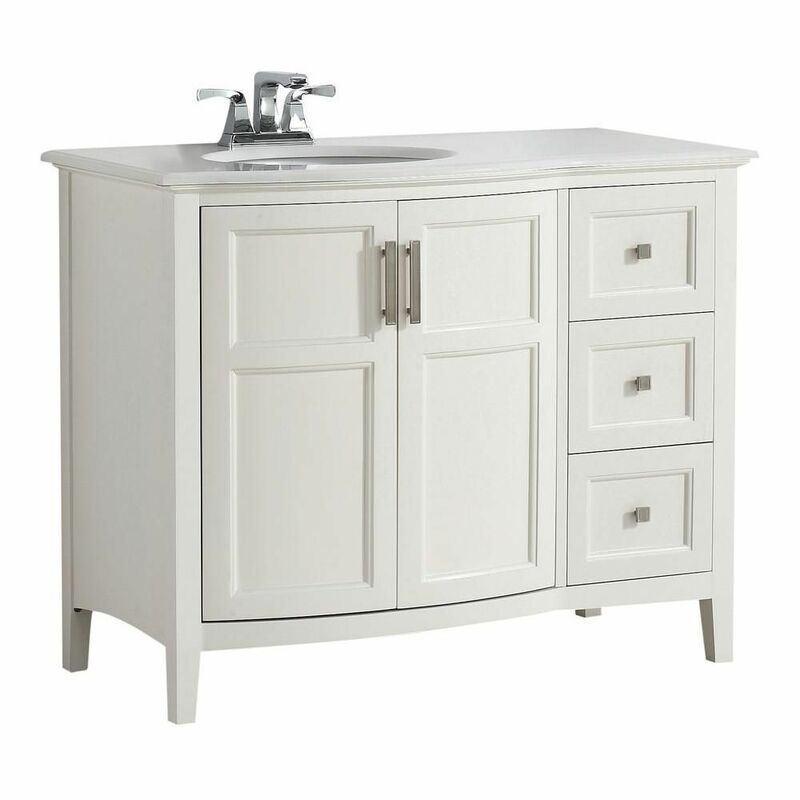 Winston 43-inch W 3-Drawer 2-Door Freestanding Vanity in White With Quartz Top in White is rated 3.6 out of 5 by 22. Rated 5 out of 5 by Mary from It is a beautiful piece. Big enough to store stuff... It is a beautiful piece. Big enough to store stuff and small enough to snug right in. Rated 1 out of 5 by Judy from I purchased this product 09/2016 due to contractor issues was not installed until 04/2018 the doo... I purchased this product 09/2016 due to contractor issues was not installed until 04/2018 the doors on the front of the vanity are now showing cracking paint. Since the warranty is only good for 1 year from date of purchase I will have to live with vanity. To purchase a item over 800.00 dollars it should last longer than a year. Rated 5 out of 5 by Norma from Love it! I had been eyeing this vanity on-line for weeks and was so happy when it came on sale. I ordered it and it was delivered right to my door. It came very well packed preventing any damage to occur. It is exactly as described and fits perfectly as the dimensions were spot on. I did have to notch out a bit of the back for the plumbing access but that wasn't a problem. I love the way the sink is not centered giving more counter space. I'm very pleased with this purchase and would definitely recommend it. Rated 5 out of 5 by Amanda from Gorgeous piece. Looks great in my new bathroom!... Gorgeous piece. Looks great in my new bathroom! Rated 1 out of 5 by Lori from Terrible quality - it's all chipping and cracking a year in. Terrible quality - it's all chipping and cracking a year in. Rated 5 out of 5 by Johanna from We are thrilled with this vanity! It is in our smaller sized master bathroom, so the rounded fron... We are thrilled with this vanity! It is in our smaller sized master bathroom, so the rounded front works to make it seem larger. The counter height of 35+ inches is ideal for my 6'4" husband. The creamy color was a concern because of the white SimpliHome med cabinet we set on the same white wall as the vanity and white commode. The cream connects the marble 6x6 tiles with the faux wood highlights in a decorative inlay to the white walls. Our contractor was pleased with the assembly as well. Rated 5 out of 5 by Rose from Beautiful vanity, came already assembled. Love it, perfect size. Beautiful vanity, came already assembled. Love it, perfect size. Rated 1 out of 5 by sat1 from Had it been delivered without so much damage, it would probably be a nice addition to the bathroom. Had it been delivered without so much damage, it would probably be a nice addition to the bathroom.